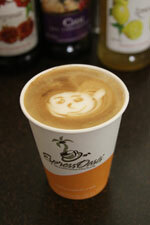 All facets of operations are handled by the EspressOasis® team including ongoing staffing. We will hire, train, and employ a staff of highly qualified "baristas". No financial outlay by the hospital or university. We will solicit your input for café design specification and colors but will internally build and finance the café ourselves. We will provide coffees at our cost, drastically reducing cost of goods as compared to other suppliers. We effectively eliminate your risk while ensuring the success of the location. Maximize returns. When we staff our own bars, we are able to maximize sales and return high profits to you.